An outcrop to the right, of the Main Wall, past a gully. The following two routes are on the next buttress to the R, beyond the vegetated gulley. There are two thin cracks. Make hard moves using both cracks to start, then move up and L to LH crack. Follow until it scunges out, then traverse R to the arete above the roof at 2/3rds height. A prominent jam crack facing into the gully. Good holds on the outside of the crack. Another crack in the gully with outside holds. Starts up a crack and continues up the wall above. Scramble onto a ledge and climb the smooth groove and crack. Pull right at the overhang (horizontal cam), and climb up on good holds to the lower angled face, protected with spaced small wires. A prominent V-corner facing north with a large semi-detached blade. Jam and layback past the blade (crux), then easier jamming to the finish. 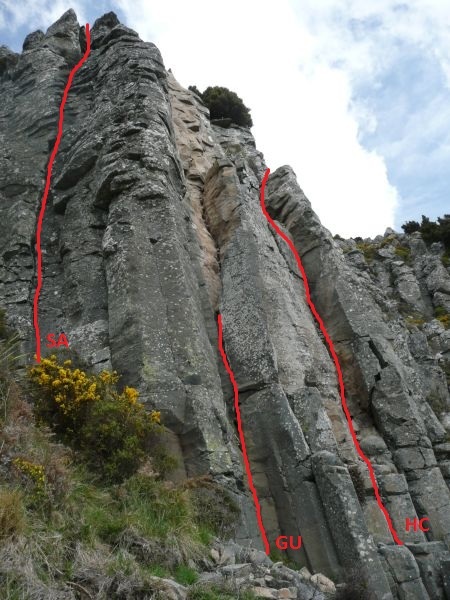 A classic route marred only by huge loose blocks at the top. Nick Cradock '75 (one aid point), FFA Murray Judge. Thin crack-line, finish up the arête and face. The R of two thin cracks. Technical climbing in the crack followed by an exit to the R over blocks and up the gully. Climb Henry Crippen, and continue up the wall on the left. Spaced pro from small wires. A short jam crack with an offwidth crux at the top. Finish up the gully. Obscure and slightly contrived. Start up an inconspicuous crack and step R to another crack (crux). Then up the edge above and finish in the gully.